I've had a couple of lovely mentions in the press lately, which is always exciting. In the essential style section of today's Sydney Morning Herald there's an article about vintage style for children. It features the lovely Jane and Katy of KatyJane, who I blogged about last week, as well as a few paragraphs about my Sweetie Petites and Children's Portraits. 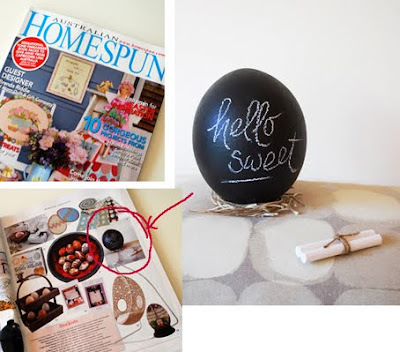 Also, the current issue of Australian Homespun features my Chalkboard Eggs. Right next to my egg is a photo of Laikonik's graphic and bright hand painted eggs. Kasia creates a new range for Easter each year - you can see them all in her online shop.